April, May and June are always busy months around here. 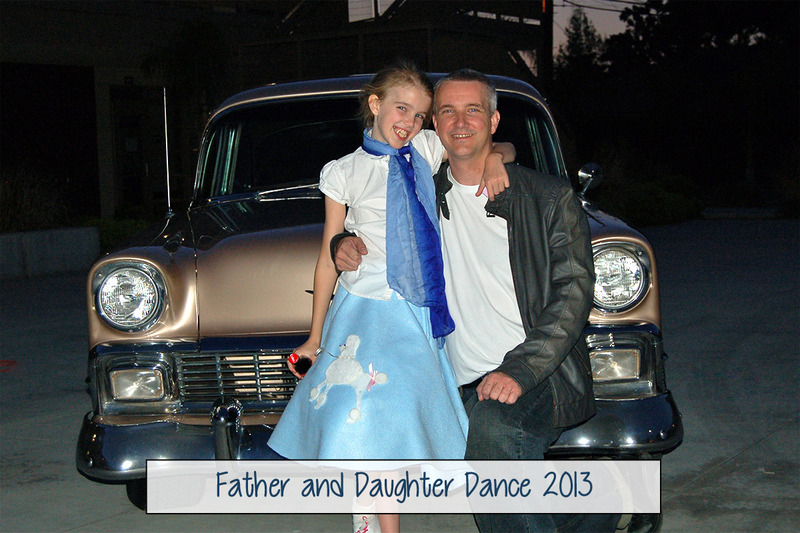 In April, we had Amara’s birthday, Honor Roll, Jog-a-thon and the 2nd Annual PTA Father Daughter Dance. I still haven’t told you about the dance! Last year’s dance had a patriotic country western theme. 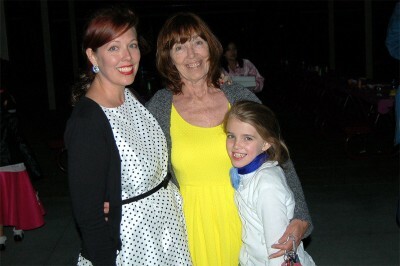 This year the theme was a 1950’s Sock Hop. 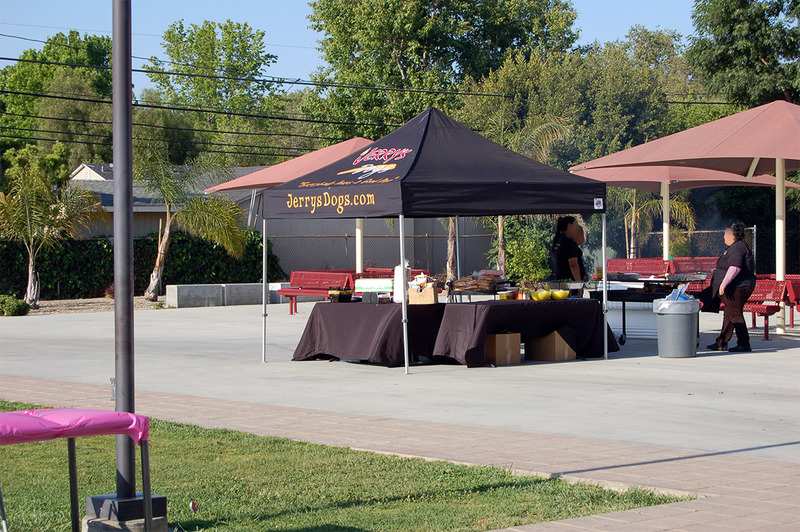 The PTA had worked hard to make this even better than last year! No easy task but I think they did it! Dinner was served at the School Diner, aka the school lunch tables. Like last year a group of volunteers (yes, I was one of them) had covered them with pink table clothes and tied them in place with pink ribbon. 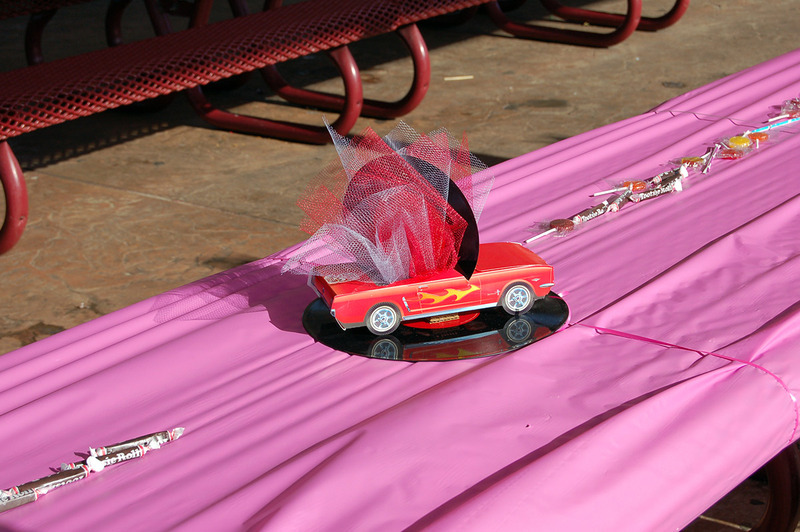 Another group of volunteer Moms had made centerpieces out of model cars punched out of cardboard, old 45 & 78 records and lots of tulle. 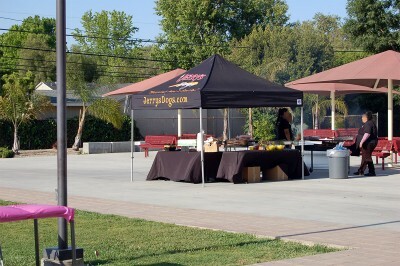 The School Diner was groovy Daddy-O! Jerry’s Hot Dogs who cooked over huge wood-fired BBQs catered the dinner. Jenna had baked 300 cake pops for dessert. The Dee Jay spun some cool tunes, a great mix of old 50s stuff along with songs the kids like today.There would be dancing for sure. Each ticket included a photo of the girl and her special guy. 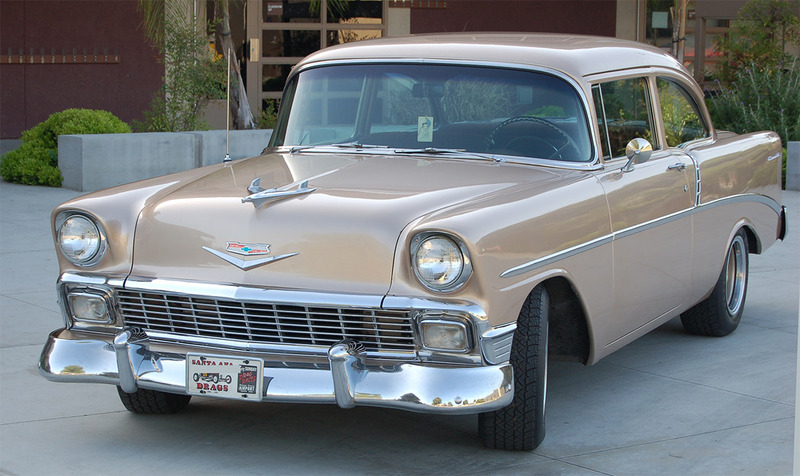 There were uncles, friends, cousins, Grandfathers and Dads! One of the other Grandmothers let the PTA use her beautiful 1956 Chevy as a backdrop for the photos.I volunteered again this year to take the pictures so I had the perfect view of how wonderful everyone looked. I had grabbed some old style bottles of Coke that they could use as props and many of them did. I’d even gotten some combs hoping I could get some of the guys to do their Fonzie imitations. I did not get any takers! The line was even longer this year and almost everyone had gotten into the spirit and dressed the part — lots of beehive hairdos and letter men’s sweaters! Amara’s other Grandma made her outfit again this year — the cutest blue poodle skirt and petticoat! It looked perfect with her little white blouse and sweater and a blue scarf tied at her throat and of course a ponytail. Justin was one hip cat in his black leather jacket and blue jeans and Jenna certainly looked the ginchiest in her polka dot dress, her bright red lipsticks & nails and her silver saddle shoes! Last year the dance was in June so this year it got dark earlier. Jenna and I closed the photo station down while they were still dancing and getting ready for the raffle drawings. Just like last year, the drawings would end the evening. They also got two raffle tickets with their admission and they could buy more, which they did. The committee had gotten some great prizes. Things such as tickets to an Angels baseball game; tickets to the Zoo; a gift certificate for pizza; season passes to the San Juan Capistrano Mission; tickets to The Sparks game, LA’s women’s basketball team. The Sparks tickets were extra special as they are for Dads & Daughters Night on June 15th. At the game, they will also receive cupcakes, t-shirts and photos with Sparky, the team mascot. 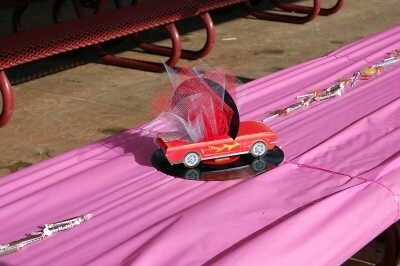 All of the raffle prizes were geared towards the Father and Daughters having another date! Jenna and Mo started texting each other and planning the theme for next year’s dance before they even got home. I can’t tell you what it is but it is going to be the best one yet and I plan to be there! This memory was posted in Special Occasions, Volunteering and tagged Father Daughter Dance, PTA on June 6, 2013 by Grandma Kc. Great event and terrific that you helped. That’s a beautiful photo of the three of you – one for the memory bank. What great photos! How cool that you are able to be a part of these events, and I know that your help is much appreciated. I think Amara’s school has THE very best events ever! Much of that, I’m sure, is because they also have THE very best volunteers, including you and Jenna! What a fun time. I don’t know how I missed it before, but it’s incredible the resemblance between Amara and her daddy! So adorable, both. Great photos! 300 hundred cake pops, oh my! Perhaps when Amara is all grown up, Jenna will be an event planner. She will have quite a portfolio. Let the Good Times Roll! This looks like so much fun! What a great event for a happy family like your own, where everyone is welcome to contribute towards a wholesome experience for the girls. 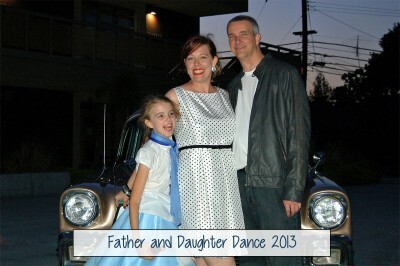 Beautiful keepsake pictures against a really cool backdrop car! What fun! I especially love the centerpieces. Very cute. Looks like a lot of fun for all involved. Oh this looks like so much fun. Haven’t done a 50s dance in forever! Thank you for describing the dance so well and the nice photos. It is so nice for those of us who live 2000 miles away and can’t be there. Keep up the nice blog.